Fighting my eyes from shutting, I searched for a bus stop. It was an early arrival in Bangkok from Krabi. I patiently waited for the bus number that was sent to me by BRB Hostel. It took dozens of buses before Bus #15 arrived at the stop. Most people hopping on and off the vehicle were not paying any amount and the bus attendant was just sitting next to the driver. When I was about to get off, I asked the lady attendant. Turned out that the bus shuttles passengers for free. I saved a few baht! BRB Hostel’s reception and lobby. Taking two lefts from the point where I dodged myself out of the free shuttle, I reached the doorsteps of BRB Hostel. It was 6 in the morning and I was glad to find a person at the front-desk who opened the tap-card enabled door. I mentioned about my reservation and asked if it’s okay to have an early check-in. Unfortunately, they were fully-booked and the room was still occupied. Probably sensing the burdens I had from the tiring trip, the staff offered the breakfast spread. Common area on the ground level. Elegant was the first adjective I used to describe the hostel’s lobby. A yellow couch is in a shape of a pouty lip just in front of a portrait, drawn using lines, of a lady. There’s a bar counter on the right where the simple breakfast is served every morning. The hostel’s sign on one of the walls is very clever by using the mirror to create the BRB brand. On the corner, next to the reception area, is another lounge area for guests. There are books, board games, and two computers that BRB Hostel guests can use for free during their stay. Management is requiring guests to take off their footwear and store it in the cabinets before going to their rooms. Check-in time is 2 PM and check-out time is 11 AM. Guest’s visitors are only allowed to stay in the common areas. 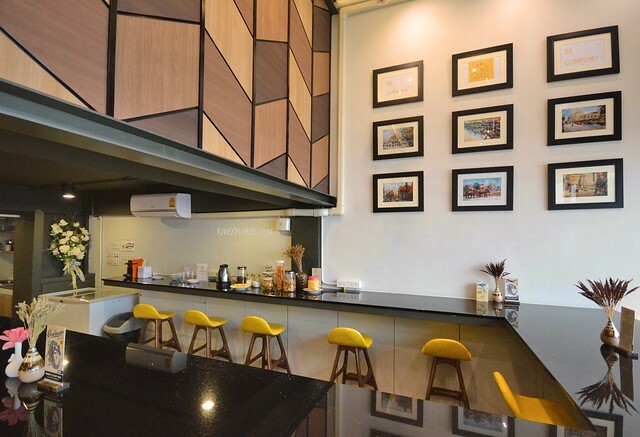 Don’t be intimidated by the classy lobby because the brand still promotes itself as a hostel. 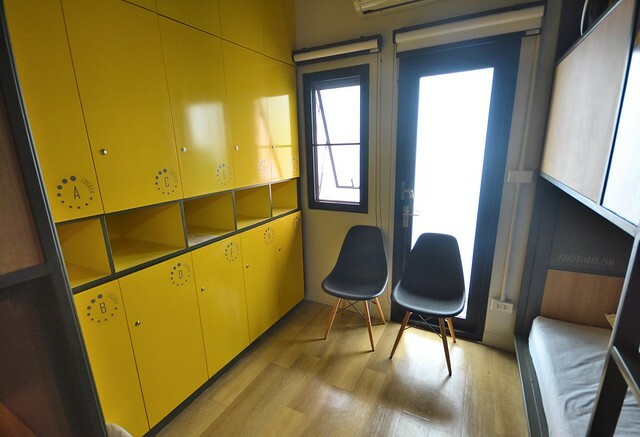 This means that dormitory rooms are available to cater backpacker travelers spending few nights in Bangkok. Bunk beds offer cozy space to rest those tired bodies from partying or roaming around the city’s night markets. Each bed is provided with a thick mattress, a pillow, and blanket. A curtain covers the entire side of the bed to maintain the privacy of guests. On one entire side of the bed lies the light source that you can use if you’re finishing few chapters of a book without the worries of disturbing other occupants in the room. Beds are properly labeled as well as the bright yellow lockers. For the toilet and shower, every floor has one but check whether if it’s appropriate for your gender. Lockers for guests availing beds in a dormitory room. My room was a private room but with shared bathroom. Yellow stands out from the white, black, and gray colors utilized for the room’s interior. 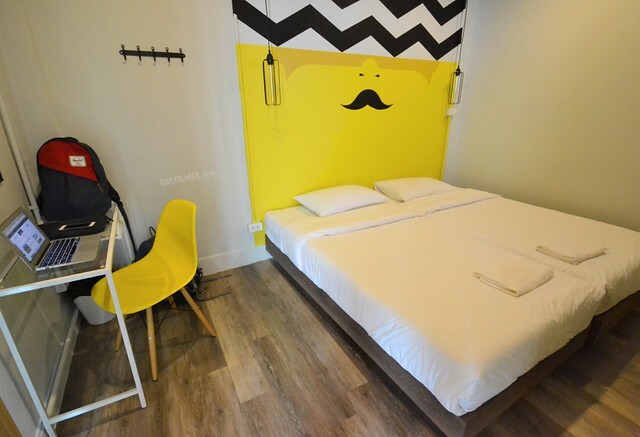 Two twin beds were placed side-on-side while a big plain yellow headboard was disturbed by a black mustache. There are two power outlets on each side of the bed and two lamps suspended near the headboard. Private room good for two. The air-conditioned room has a flat-screen television and a working desk. The room I got has a window offering a view of the alley in front of the hostel. For the toilet and shower, BRB Hostel’s private room avails the common bathroom. Since my room doesn’t have an en-suite bathroom, I needed to use the shared ones. From 7 AM to 10 AM, a simple breakfast is offered at the bar counter on the reception. 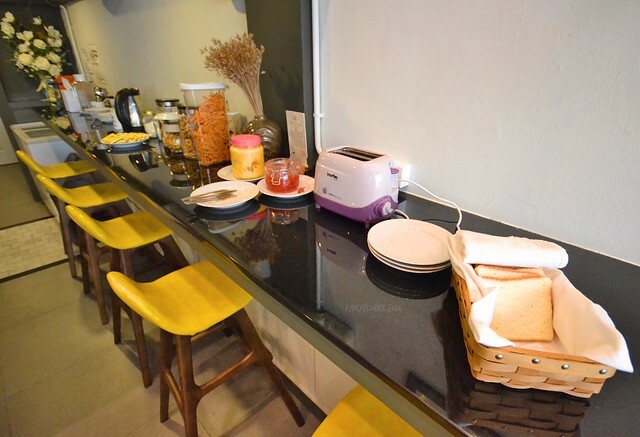 Breakfast spread offers bread, butter and jam, few options of cookies, and coffee and tea. 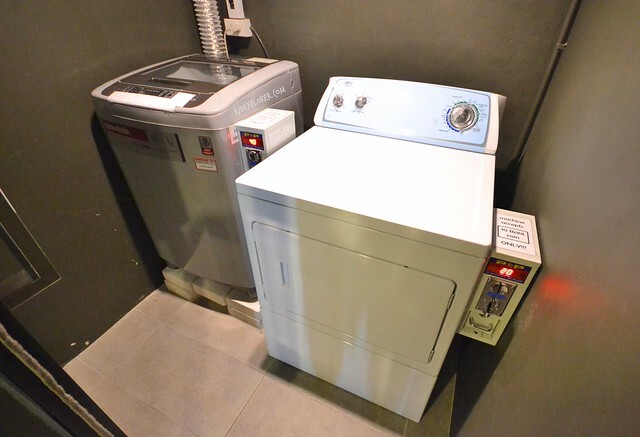 If you need to wash your dirty clothes, they have a laundry facility at standard rates; THB40 for washing and THB10 for a 30-minute drying. Simple breakfast every morning from 7AM to 10AM. 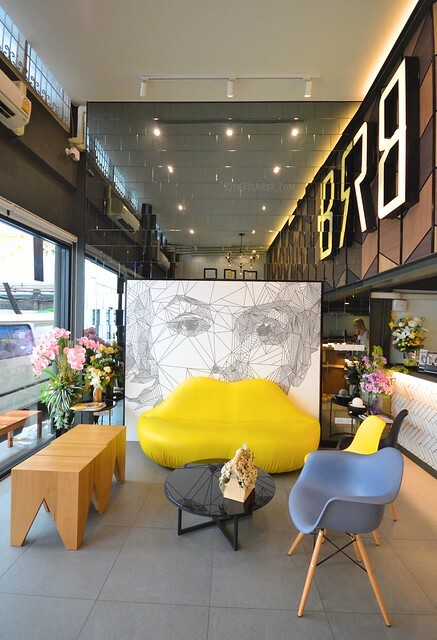 With BRB Hostel in Silom, you can find several interesting things to do in the area. Few hundred meters from the hostel across Silom Road is Patpong Street. The street is infamous for some Ping Pong Show but also great for some shopping. Nine hundred meters away is Lumpini Park, tucked in the middle of the city perfect for some morning or afternoon walks. The park has several lakes surrounded by countless benches shaded with canopies of trees. Others do biking around the park while others rent some pedal boats to wade through the lake. 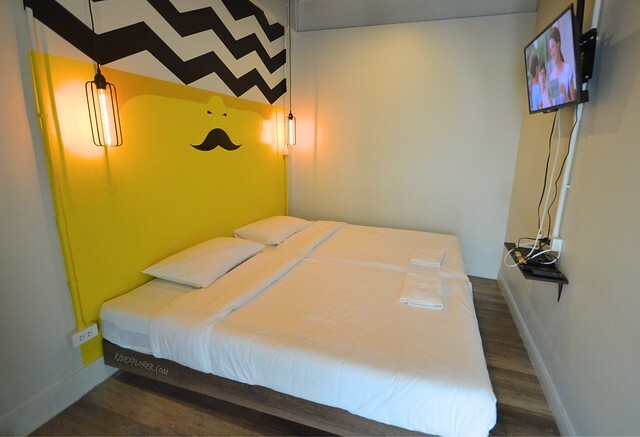 BRB Hostel is also accessible to major sites in Bangkok because of its proximity to Sala Daeng BTS Station. In addition to that is the Silom MRT Station, a better link to Asok and shopping centers of Bangkok. If local dining is one of your interests, the hostel is just a block away from a local food court. The place caters employees on the nearby corporate building making it the best spot for lunch. On my first visit to Bangkok, I stayed near Ratchatewi Station and I thought Silom area is too far from the shopping and fun scenes of the city. But again, I was wrong! Staying within Silom, in BRB Hostel in particular, makes you more connected with the shopping centers in downtown Bangkok. 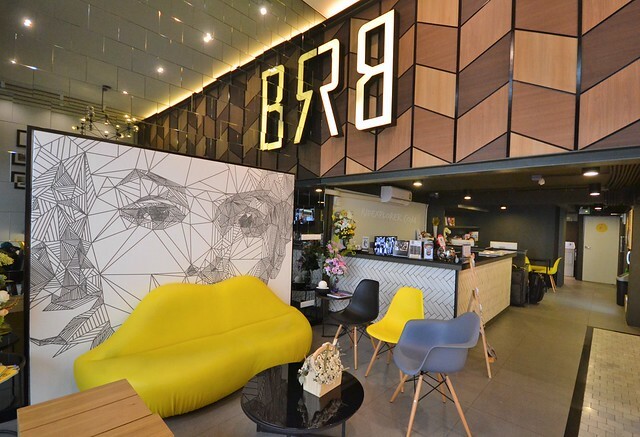 A stay in BRB Hostel will surely bring the hostel experience to a new level and concept. Parang ang nice naman dito mag stay.